I’ve only known Adam for about twenty years. Well, I met him over twenty years ago I think over one of John Forbes’ curries in an Adelaide backyard? I’ve also known his poems for that long. That was back when he and Mark Roberts co-edited one of the last roneo & silkscreen magazines of our times – called ‘P76’ – after Australia’s own, all Australian-built Leyland P76 – ‘the Australian car that’s anything BUT average’ as the advertising slogan ran. Since then, he has published Letters To Marco Polo, In One House, the chapbook Crossing Lake Toba and Romeo and Juliet in Subtitles. Adam and Alan Jefferies ran a terrific series of readings for the Poets Union back in the late 80s. And, more recently, for a time, he was assistant editor of the poetry for HEAT magazine’s original series. And now he is about to grace our bookshelves and our libraries with the new chapbook we’re celebrating today. Adam is interested in hybridity (although he would recognize a slight redundancy in my using that term) but it’s not necessarily an interest in a hybrid of genre or style in his poetry, although a kind of hybrid in-between-ness and ambivalence should be good for poetry in general, granting, as it does, a mutability - but Adam, in his writing, inevitably draws on his own mixed identity (or to use a term one of yesterday’s panellists introduced I guess I could say his ‘co-existent’ identities). He has travelled really widely accompanied by a possibly insuperable compulsion to decipher or analyse hybridities & co-existences and his poems often seem to have been motivated by this. When the term ‘hybridity’ was fashionable in critical circles five or six years ago, it became ultimately romanticised as a solution to moving in and out of cultural structures and boundaries – and so has gradually passed out of currency or fashion. But anyway I think the poems Adam has written from his own take on it , particularly in the earlier collection In One House, are always complex, always rich, often witty, deeply observant and interpretive. For a long time now I’ve wanted to make a t-shirt emblazoned with ‘Authentic Local’ – you could wear it anywhere. I think Adam would like one. Another example of Adam’s interest in hybrid or mixed-up forms is his fish soup. He’s an excellent cook and from some zesty ingredients he makes a delicious, piquant Thai-style fish soup. However, back to our little haven of homogeneity and this neat collection of eight poems, beautifully designed, as is usual in their productions, by Vagabond Press. To launch this chapbook I thought I’d just run through a kind of precis, giving a glimpse of the poems themselves. And I’ll be quite brief, leaving time for Adam to present some of the poems to us. Then come on again, brighter ! A few years ago, Adam spent some months as an AsiaLink resident in Kuala Lumpur in Malaysia. And, in these powerful caves, the poet reflects on a personal nightmarish trauma of being knifed in KL’s Chinatown. 'First Contact' is a humorous, kind of generic poem about failing in romance that begins with a series of ‘at first sight’ chance encounters that might lead to the bedroom… at the Paris metro, friend of a friend at a cocktail party and ends with our poetic hero disappointed and abandoning the scene. In 'The Bargain', Adam is in resonant phrase. It’s a beautiful poem, written in couplets, about, or, really, honouring a long-living Thai grandmother who knows how to strike a bargain. So now I’ll end the quotes and hope that they’ve given you a sense of the direction Adam’s poetry is heading. 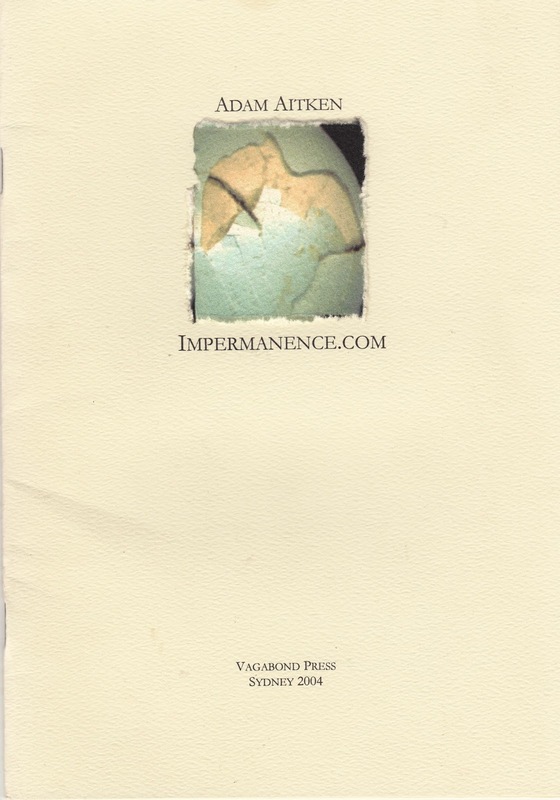 Maybe in ‘Impermanence.com’ there is a little less of his usual cryptic turn – the poems here are somehow loosened up but most of them, except perhaps the family ones, 'The Bargain' and 'The Fire Watchers', are also more gritty than usual. So I wish this book and its author good fortune – may these poems be read by many and may Adam’s poetic talents be rightfully recognized and rewarded.